Science Foo Camp (SciFoo) is an invitation based science unconference that is organised by O’Reilly media, Google, Nature, and Digital Science. Or put it another way, a weekend event (from Friday evening to Sunday afternoon), where 250 scientists, science communicators and journalists, technology people from area that relate to science, artists and ‘none of the above’ come and talk about their interests, other people interests, and new ideas, in a semi-structured way. As this is an invitation only event, when I got the invitation, I wasn’t sure if it is real – only to replace this feeling with excitement after checking some of the information about it (on Wikipedia and other sites). I was also a little bit concerned after noticing how many of the participants are from traditional natural science disciplines, such as physics, computer science, neuroscience, chemistry, engineering and such (‘Impostor syndrome‘). However, the journey into citizen science, since 2010 and the first Citizen Cyberscience Summit, have led me to fascinating encounters in ecological conferences, physicists and environmental scientists, synthetic biologists, epidemiologists, and experimental physicists, in addition to links to Human-Computer Interaction researchers, educational experts, environmental policy makers, and many more. So I hoped that I could also communicate with the scientists that come to SciFoo. I was especially looking forward to see how the unconference is organised and run. I’ve experienced unconferences (e.g. WhereCampEU in 2010, parts of State of the Map) and organised the Citizen Cyberscience Summits in 2012 & 2014 where we meshed-up a formal academic conference with unconference. I was intrigued to see how it works when the O’Reilly media team run it, as they popularised the approach. The event itself run from the evening of Friday to early afternoon on Sunday, with very active 45 hours in between. The opening of the event included the following information (from Sarah Winge, Cat Allman, Chris DiBona, Daniel Hook, and Tim O’Reilly): The Foo Camp is an opportunity to bunch of really interesting people to get together and tell each other interesting stories – talk about the most interesting story that you’ve got. The main outputs are new connections between people. This as an opportunities to recharge and to get new ideas – helping each person to recharge using someone else battery. The ground rules include: go to sessions outside your field of expertise – an opportunity to see the world from a different perspective; be as extroverted as you can possibly be – don’t sit with people that you know, as you’ll have a better weekend to talk to different people. The aim is to make a conference that is made mostly from breaks – it’s totally OK to spend time not in a session; the law of two feet – it’s OK to leave and come from sessions and coming and going. It’s a DIY event. There are interesting discussions between competitors commercially, or academically – so it is OK to say that part of the conversations will be kept confidential. The expected scramble to suggest sessions and fill the board led to a very rich programme with huge variety – 110 sessions for a day and a half, ranging from ‘Origami Innovations’, ‘Are there Global Tipping Points?’, to ‘Growth Hacking, Rare disease R&D’, and ‘What we know about the universe? and what we don’t know?’. Multiple sessions explored Open science (open collaborations, reproducibility, open access publication), issues with science protocols, increasing engagement in science, gender, social justice side by side with designer babies, geoengineering, life extension, artificial intelligence and much more. In addition, several curated sessions of lightning talks (5 minutes rapid presentations by participants), provided a flavour and extent of the areas that participants cover. For example, Carrie Partch talk about understanding how circadian cycles work – including the phenomena of social jet-lag, with people sleeping much more at weekends to compensate for lack of sleep during the weekdays. Or Eleine Chew demonstrated her mathematical analysis of different music performances and work as concert pianist. I’ve followed the advice from Sarah, and started conversation with different people during meals, or on the bus to and from SciFoo, or while having coffee breaks. Actually everyone around was doing it – it was just wonderful to see all around people introducing themselves, and starting to talk about what they are doing. I found myself learning about research on common drugs that can extend the life of mice, brain research with amputees, and discussing how to move academic publications to open access (but somehow ending with the impact of the cold war on the investment in science). I have organised a session about citizen science, crowdsourcing and open science, in which the discussion included questions about science with monks in Tibet, and patient active involvement in research about their condition. I’ve joined two other sessions about ‘Making Science Communication Thrilling for the Lay Person‘ with Elodie Chabrol (who run Pint of Science) and Adam Davidson; and ‘Science Communication: What? What? How? Discuss‘ with Suze Kundu, Jen Gupta, Simon Watt & Sophie Meekings. Plenty of ideas (and even a sub-hashtag to get responses for specific questions) came from these sessions, but also realisation of the challenges for early career academics in developing their skills in this area, with discouraging remarks from more senior academics, and potential career risks – so we also dedicated thinking about appropriate mechanisms to support public engagement activity. Another fantastic discussion was led by Kevin Esvelt about ‘Better than nature: ethics of ecological engineering‘ – when this involve gene editing with techniques such as CRISPR with potential far reaching impact on ecological systems. This session just demonstrated how valuable it is to have interdisciplinary conference where the expertise of the people in the room range from geoengineering to ecology and ethics. It was also a mini-demonstration of Responsible Research and Innovation (RRI) in action, where potential directions of scientific research are discussed with a range of people with different background and knowledge. The amount of input, encounters and discussion at SciFoo is overwhelming, and the social activities after the sessions (including singing and sitting by the ‘fire’) is part of the fun – though these were very exhausting 40 hours. Because SciFoo invitees include a whole group of people from science communication, and as SciFoo coincide with Caren Cooper stint of the twitter account @IamSciComm account where she discussed the overlap between citizen science and science communication, I paid attention to the overlap during the meeting. The good news is that many of the scientists had some idea of what citizen science is. I always check that people know the term before explaining my work, so it’s great to see that term is gaining traction. The less good news is that it is still categorised under ‘science communication’ and maybe a useful session would have been ‘What is the problem of scientists with citizen science?’. 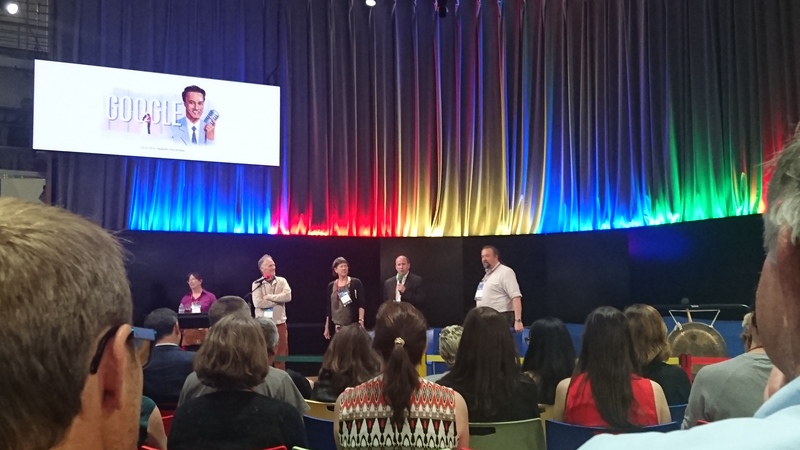 For me, SciFoo raised the question about the value of interdisciplinary meetings and how to make them work. With such a list of organisers, location, exclusiveness and the mystery of invitation (several people, including me, wonder ‘It’s great being here, but how did they found out about my work?’) – all make it possible to get such an eclectic collection of researchers. While it’s obvious that the list is well curated with considerations of research areas, expertise, background, academic career stage, and diversity, the end results and the format open up the possibility of creative and unexpected meetings (e.g. during lunch). My own experience is that to achieve something that approach such a mix of disciplines in a common ‘bottom-up’ academic conference is very challenging and need a lot of work. The Citizen Cyberscience summits, ECSA conference, or the coming Citizen Science Association conference are highly interdisciplinary in terms of the traditional academic areas from which participant come – but they require to convince people to submit papers and come to the conference. Usually, the interdisciplinary event is an additional commitment to their disciplinary focus and this creates a special challenge. Maybe it can be possible to achieve similar interdisciplinary meetings by getting endorsements from multiple disciplinary societies, or get support from bodies with wide remit like the Royal Society and Royal Academy of Engineering. Another thought is that the model of reaching out to people and convincing them that it is worth their while to come to such a meeting might also work better in allowing mixing, as open call are impacted by ‘self deselection’ where people decide that the conference is not for them (e.g. getting active participants to a citizen science conference, or ensuring that papers are coming from all flavours of citizen science). 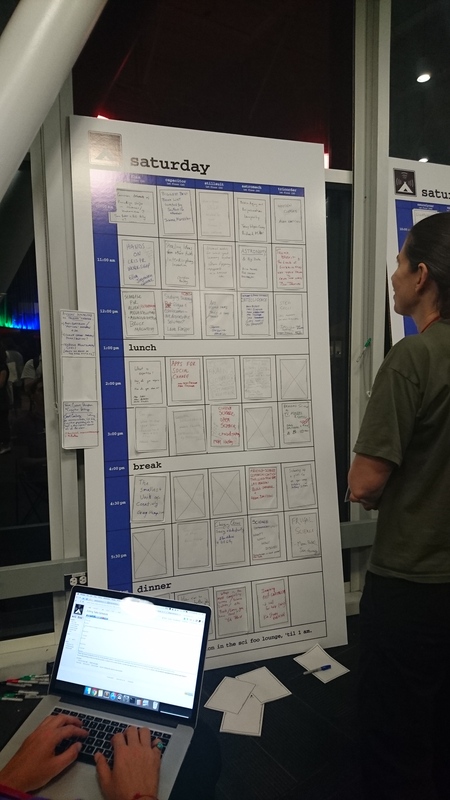 Another delightful aspect is to notice how the unconference format worked with people that (mostly) haven’t experienced it before – the number of slots and opportunities was enough for people to mostly put their sessions forward. Although the call for people to be extroverts, the people with less confident will prepare their ideas more slowly, and can end up outside the grid. It was nice to see how some places in the grid were blocked off during the early stages, and then release to ideas that came during breaks, or for sessions that were proposed more slowly and didn’t secure a spot. There might be also value in restricting people to one session, and then progressing to more? What are the steps that are required to make an unconference format inclusive at the session setting stage? 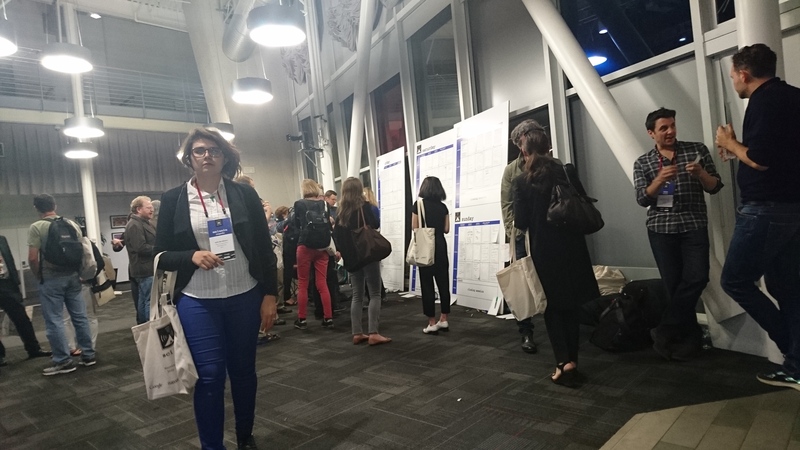 In contrast to the approach in academic meetings to control the number of parallel sessions (to ensure enough people are showing up to a session), SciFoo is having so many, that most of the sessions are with a small group of about 10 or 20 people. This make it more valuable and suitable for exploratory discussions – which worked well in the sessions that I attended. In a way, at its best, SciFoo is many short brain storming sessions which leave you with a wish to discuss for longer. If you get an invitation (and being flattered is part of the allure of SciFoo), it is worth going on the Wiki, give a bit of a description of yourself and think about a session that you’d like to propose – +1 can help you to get a feeling that people will be interested in it. Think about a catchy title that includes keywords, and remember that you are talking to intelligent lay people from outside your discipline, so prepare to explain some core principles for the discussion in 5 minutes or so. Don’t dedicate the time to tell people only about your research – think of an issue that bother you to some degree and you want to explore (for me it was the connection between citizen science and open science) and consider that you’ll have one hour to discuss it. Follow the advice – say hello to everyone and have great conversations during breaks, and don’t go to sessions if the conversation is more interesting. Another take on the meeting is provided by Bjoern Brembs on his blog, with whom I had the open access conversation (and I still unsure how we ended with the Cold War). Also remember to enjoy the experience, sit by the ‘fire’ and talk about things other than science!